The uprush of the strings to the first triumphant E flat major full orchestral chords of Elgar’s concert overture In the South normally tell you what sort of performance is in store. Elgar dedicated the piece to his friend and wealthy patron Frank Schuster and later wrote to Percy Pitt that it was all about "the joy of living". That is exactly what we heard at the opening concert of the NFM Wroclaw Philharmonic Orchestra’s new season on 5 October: full-blooded, exuberant orchestral playing of passion and intensity. Conductor Jacek Kaspszyk knows the score inside out and transmitted his feel for it to the players. There was warmth and colour in the woodwinds, a beautiful sheen to the strings (the lower strings especially) and a brass section that was prepared to attack every note. The result was occasionally overwhelming in a hall the size of the orchestra’s present (temporary) premises, but substitute "the joy of music making" for "the joy of living" and this performance delivered in spades. 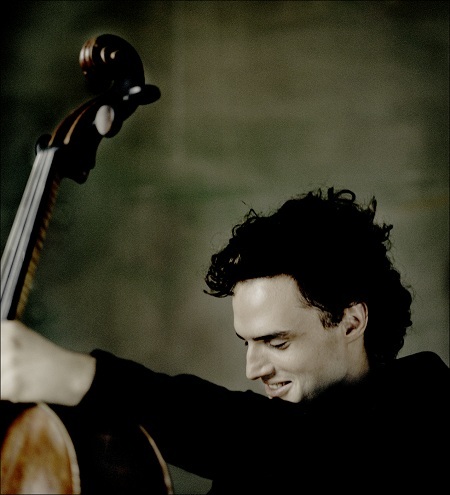 The soloist for Elgar’s cello concerto was the young German cellist Leonard Elschenbroich, who lives in the UK and who has just been announced as a BBC3 New Generation Artist. From the opening bars, Elschenbroich set out his stall: this was not to be a wistful, introverted performance but a strong, assertive and dramatic account of the piece. The first movement was taken at a deliberate, perhaps unusually slow tempo but as the second movement burst into life, the overall effect made sense. Elschenbroich’s passage work was outstandingly clean and his sense of rapport with the conductor’s mercurial, fractional changes of tempo was very evident. He played the work as the romantic piece it is, but his shaping of the melodic lines gave the concerto a particularly well-defined sense of structure. The third movement exuded hushed rapture, and gave Elschenbroich multiple opportunities to showcase his purity of tone, varying his vibrato almost from bar to bar: the fourth was sprightly, joyous and built to a triumphant climax. The packed auditorium demanded an encore: Elschenbroich obliged with a short movement from a Paul Hindemith cello sonata. This was an auspicious debut by a young artist with the Wroclaw orchestra and a performance to treasure. After the interval came the Enigma Variations, the work which perhaps more than any other made Elgar’s worldwide reputation. Once again, Kaspszyk showed that he knows and loves his Elgar, and can judge exactly how to ‘weight’ each of the fourteen variations Elgar wrote on his opening theme. So the mood varied between light and playful, rippling woodwind over muted strings, to sonorous and imposing, brass chorales answering incisive horn calls. The soft clattering on the timpani may have been made by Polish zloty rather than Elgar’s prescribed half crowns, but the orchestra played the work as if it were in their own DNA – with passion, warmth and total commitment. Kaspszyk judged Nimrod particularly well, sensing the forward drive that the movement needs to prevent it becoming sentimental, while controlling to perfection the dynamics of the inexorable build-up to the movement’s wonderful climax. In any venue, in any country, this performance would have stood out as an inspiring piece of music making. After the performance, the award. An all-Elgar programme may have seemed counter-intuitive for a city concert hall in south west Poland with a proud tradition of the largely Germanic classical and romantic repertoire, but there was a reason for the choice of programme: even as the echoes of Nimrod died away, an emotional Kaspszyk was presented onstage with the Elgar Society medal, its highest accolade, for his services to the music of Elgar. Conferring the award, the Chairman of the Elgar Society, Steven Halls, who had led a small delegation to Wroclaw for the event, spoke of Kaspszyk’s longstanding commitment to the performance and promotion of Elgar’s works outside the UK. The Wroclaw Philharmonic’s opening concert of the season could hardly have provided more eloquent testimony of what was said. This was an evening of Elgar’s music to make an Englishman – and there were a number in the audience – feel proud.